Charles F. Knight, whose forceful personality and business acumen transformed Emerson from a successful, domestic manufacturer of motorized electrical products to a global technology giant, has died. He was 81. When he was named CEO of Emerson at age 37 in 1973, he became the youngest person to lead a billion-dollar company. He retired nearly three decades later and had helped convert Emerson into a company that had more than $15 billion in annual revenue. Mr. Knight credited a childhood experience for his approach to work and to life. His father, a management consultant, had groomed him to be a business leader. During summer break when he was 16, his father drove him from their home near Chicago to a small Canadian town where a client operated a foundry. The elder Knight arranged for his son to live alone in a rooming house and asked the foundry manager to give him the hardest work possible. Mr. Knight, whose confidence was bolstered by his imposing height and Hollywood-good looks, died Tuesday morning (September 12, 2017) from complications of Alzheimer’s disease at Missouri Baptist Medical Center. According to the Associated Press, the company, which is headquartered in Ferguson, is now ranked 139th among the Fortune 500, with 74,000 employees worldwide. A memorial service will be held Saturday at the Episcopal Church of St. Michael and St. George. Emerson was founded in 1890 as Emerson Electric Manufacturing Co., a manufacturer of electric motors and fans. In 1892, it became the first to sell electric fans in the United States. It quickly expanded its product line to include electric sewing machines, electric dental drills and power tools. Before joining Emerson, Mr. Knight was a management consultant in his father's firm, Lester B. Knight & Associates Inc. in Chicago. Emerson was one of their clients and the company was in search of a new chief executive. He decided to apply for the job. When he came on board in 1973, Emerson was on the cusp of being a billion-dollar company. Mr. Knight successfully shifted the company's focus from electromechanical technology to electronic technology. He grew the company, even during the manufacturing lull of the mid-’80s, through acquisitions and by making controversial moves into the global marketplace. Going into the international arena often meant domestic job losses. Mr. Knight defended his decisions as necessary strategy. ''We never would have built the plants we did without knowing (the costs),” said Mr. Knight, who was known for his fierceness, both in temperament and commitment. During Mr. Knight’s 27-year tenure, one of the longest in business history, Emerson achieved its unprecedented record of 43 consecutive years of earnings growth and 44 years of consistent dividend growth. He led company growth from a dozen divisions, generating total revenues of $1 billion to more than 60 businesses with revenues totaling over $15 billion. International sales grew from 12 percent of the total to nearly 40 percent. 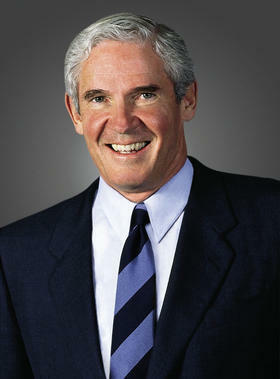 He retired in 2000 after 27 years as CEO, remaining chairman until 2004. Charles Field Knight was born Jan.20, 1936, in Lake Forest, Illinois. He married his high school sweetheart, Joanne Parrish, in 1957. Mr. Knight earned his undergraduate engineering degree in 1958 from Cornell University, where he played varsity football and tennis. He also earned his MBA at Cornell, while coaching freshman football and teaching plumbing at its hotel school and graphics at the engineering school. Numerous entities in the region bear witness to his philanthropy, including the Charles F. Knight Emergency & Trauma Center at Barnes Jewish Hospital, Washington University’s Charles F. Knight Executive Education Center, and the Charles F. and Joanne Knight Alzheimer’s Disease Research Center at the university’s medical school. Mr. Knight served as chair of Civic Progress and on the boards of Anheuser-Busch, AT&T, IBM, Baxter International, BP, Caterpillar, Morgan Stanley and the Olin Foundation. He was a longtime trustee of Washington University and, after retiring, taught a popular MBA class at the Olin School of Business. He was particularly supportive of educational and children’s organizations, which included the Mathews-Dickey Boys’ & Girls’ Club and Annie Malone Children and Family Service Center. In keeping with his legacy, in 2014, Emerson pledged $4.4 million for Ferguson scholarships and job training following the shooting death of Michael Brown. His book, Performance Without Compromise, was published by the Harvard Business School Press in 2005. In addition to his wife of 60 years, Joanne Parrish Knight, Mr. Knight’s survivors include four children: Lester B. Knight (Becky) of Chicago, Anne Knight Davidson of St. Louis, Steven P. (Anne) Knight of Seattle, Jennifer Knight (Andrew) Beckmann of Chicago; 12 grandchildren; and three great-grandchildren. Mr. Knight is also survived by his sister, Leslie Knight Abbott (Robert). A memorial service will be at 4 p.m. on Saturday, at the Episcopal Church of St. Michael and St. George, 6345 Wydown Blvd., in Clayton. In lieu of flowers, the family would appreciate memorials to the Alzheimer's Disease Research Center at Washington University School of Medicine.